If it doesn’t exist, we create it. “Don’t tell me it can’t be done” was our founder Wally Byam’s trademark phrase. Back when he built the first Airstream with his own hands, everything about its design was a first, from its teardrop shape to the ice box and stove on board. But groundbreaking design hardly stopped with the first Airstream. In fact, there have been plenty of firsts after that. The iconic riveted aluminum shell that’s light, strong, and self-supporting just like an airplane’s fuselage. The first workable hot water system. The first flushable toilet with a waste holding tank. The first ladder frame. The first pressurized water system. The first fully self-contained travel trailer. 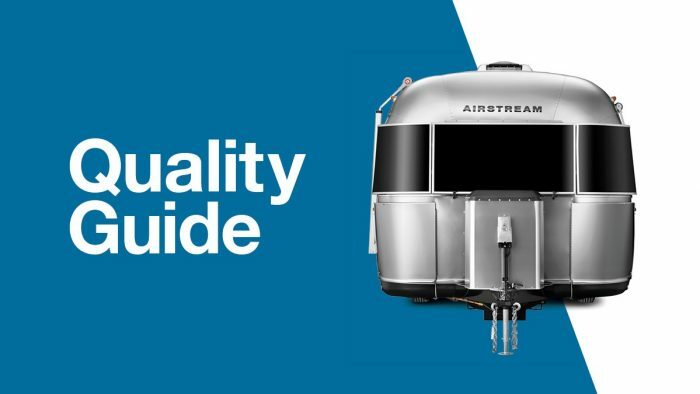 But what really sets Airstream apart? Those vital to the company’s growth were innovators. They invented new ways of doing things that resulted in a superior product, and their obsession with improving their product is a quality that endures in the modern era. 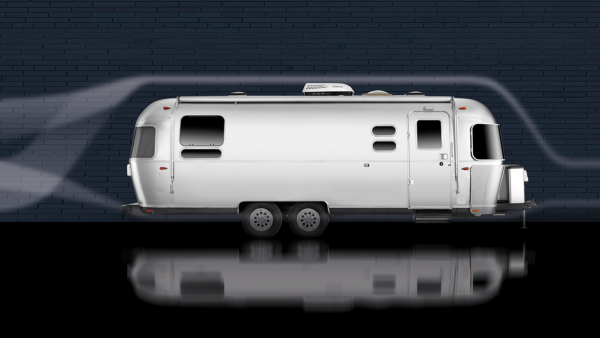 Airstream’s patented aerodynamic, low-profile shape naturally delivers low wind resistance, creates less draft, and offers a safer and easier driving experience. Side winds from passing traffic are reduced as well, with sway almost unnoticeable even in heavy winds. The sleek shape means a tow vehicle’s fuel efficiency can be improved up to 20% over similarly-sized travel trailers. It’s a design like no other RV on the market, and one that will turn heads everywhere you go. Each wheel has its own suspension. The premium rubber torsion axle absorbs 50% more road vibration than the leaf springs used on most other trailers, which minimizes the amount of road shock transferred to the body of the trailer. This allows for a more stable and comfortable towing experience. And because each axle is independent, dual-axle models can be towed short distances even with a flat tire. It’s like floating on air. The interiors of our travel trailers are just as modern as the exteriors. All the modern appliances, climate control, and entertainment systems you love at home are ready to go in each trailer. 110V outlets and USB ports are strategically placed throughout so charging your devices on the road is simple and easy. And every piece of furniture is as thoughtful and useful as it is beautiful. We approach the interior design of our touring coaches just like we would a luxury home, private jet, or yacht. It makes a statement right when you walk inside, and continues to impress as you explore. Ultraleather® seating. Corian® countertops. Italian cabinetry. Infinity woven flooring. More than 50+ best-in-class features – every single one standard. The iconic streamlined design of our travel trailers inspired our touring coach lineup to be just as sleek. That’s why we build every step, awning, and storage compartment door to fit, close, and look like a seamless part of the body design. And it’s why we make every effort to maintain the clean, luxury automotive design of the Mercedes-Benz chassis we start with – already a thing of beauty on its own. Our partnership with Mercedes-Benz® just comes naturally. 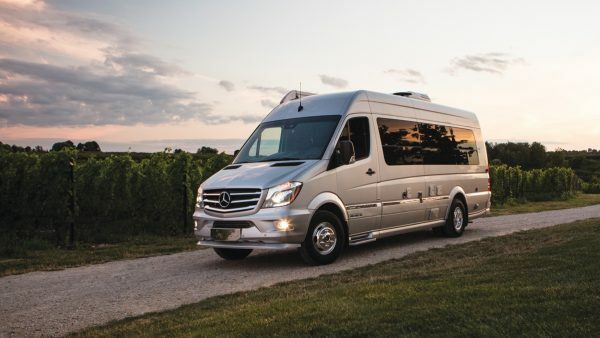 Mercedes-Benz’s reputation for the best safety and convenience matches Airstream’s standards for lasting quality. That’s why we include more Mercedes-Benz safety and performance features than anyone else, from rear- and side-view cameras and assist features to the Parktronic® parking system. We also add in features of our own, like our optional Air Ride Suspension for a smooth ride in virtually any road conditions.